While there is a great deal of attention paid to the goal of providing well-daylit spaces in our buildings, our ability to describe the parameters of “a well-daylit space” have not progressed in the past few decades. Daylight illumination levels in a space are dynamic, constantly changing both in intensity and spatial distribution pattern as the two variable sources of daylight - the sun and the sky - interact with the geometry and physical properties of the space, the exterior context, and interior conditions. Most current evaluations of daylight performance however are made using greatly simplified “snap-shot” or single-point-in-time methods that do not account for all the influences on daylight illumination levels nor the variation over time. Indeed, the most common method, the Daylight Factor, does not even include the contribution from sunlight, only skylight, and even then under the simplified assumptions of the International Commission on Illumination (CIE) standard overcast sky distribution. 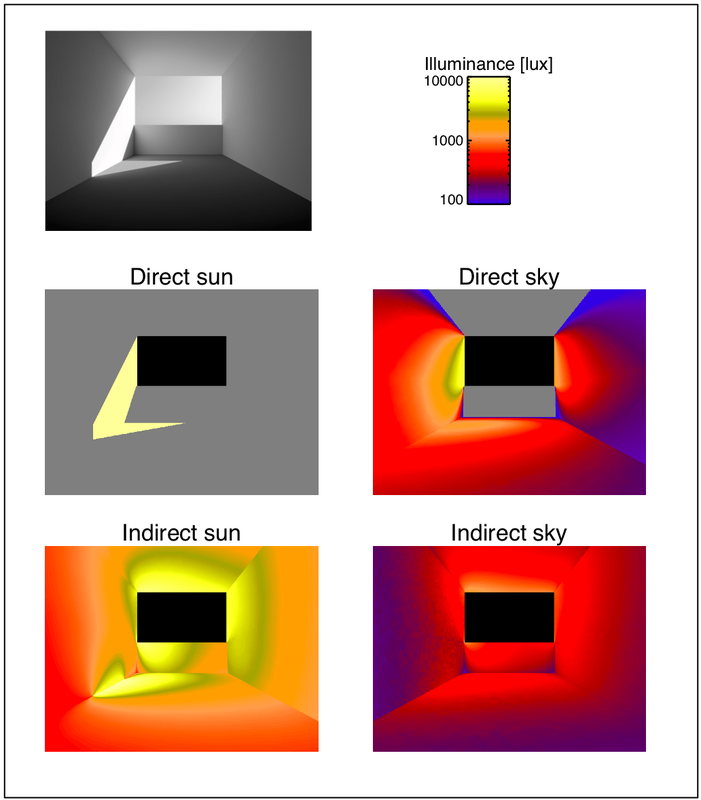 Alternatively, many practitioners try to understand the pattern of sunlight in a space via study of the sun-path diagram, or a dynamic solar shading analysis, but without analysis of resulting illumination levels or the contribution of light from the sky or reflected light from the sun. While both of these methods provide the experienced designer with some insight into how daylight will be distributed in the space, both provide only a partial understanding. Using these methods, the designer must integrate this information with internalised experience about local weather variation patterns, reflectance of materials, etc., in order to infer the resulting visual qualities of the space. While many experienced designers have indeed achieved an intuitive synthesis of this information, that knowledge is not easily transferred to new locations, evaluated, or communicated to others before a building is constructed. The designer’s knowledge can only be acquired through on-the-job apprenticeship; it does not lend itself to wide dissemination through classroom teaching, nor can it be codified in standards. In the last decade, the role that daylight evaluation plays in the design process has acquired a new impetus as the need to demonstrate compliance with various 'performance indicators' becomes ever more pressing. Two of the most used rating systems are BREEAM (The BRE Environmental Assessment Method) and LEED (Leadership in Energy and Environmental Design) which originated in the UK and US respectively, though they are both used world-wide. Note that, in an effort to harmonise the various rating systems, a Memorandum of Understanding between BREEAM, LEED, the UK Green Building Council and Green Star (Australia) was signed on March 3rd 2009. Both the LEED and the BREEAM websites chart the growth in the building projects that have been certified using the respective schemes. These and similar rating systems are actively promoted by government departments and lobby groups. Daylighting is not just about illumination for task. The body of empirical data from photobiology studies is now sufficient to allow us to develop preliminary non-visual lighting evaluation methods for lighting design. These effects have the potential to become a relevant quantity to consider when assessing the overall daylighting performance of a space. See "A Framework for Predicting the Non-Visual Effects of Daylight – Part I: Photobiology-based Model", Andersen, Mardaljevic & Lockley. Design guidelines worldwide currently recommend daylight provision in terms of the long-established daylight factor (DF). First proposed in the UK in the early 1900s and formalized into building standards over fifty years ago, the daylight factor is simply the ratio of internal illuminance to unobstructed horizontal illuminance under standard CIE overcast sky conditions [Hopkinson, 1963]. It is usually expressed as a percentage, so there is no consideration of absolute illumination values. The luminance of the CIE standard overcast sky is rotationally symmetrical about the vertical axis, i.e. about the zenith. And, of course, there is no sun. Thus for a given building design, the predicted DF is insensitive to either the building orientation (due to the symmetry of the sky) or the intended locale (since it is simply a ratio). In other words, the predicted DF value would be the same if the building had North-facing glazing in Stornoway or South-facing glazing in Brighton. The same would be true if the locations were Seattle and Miami - or indeed for any city in any country. Because the sun is not considered, any design strategies dependant on solar angle, solar intensity, or redirection of sunlight have no influence on the DF. Actual daylight illumination conditions deviate markedly from the overcast sky paradigm. This is so even for Northern Europe where there is a commonly held belief that skies are 'mostly' overcast and so use of the daylight factor as a basis for evaluation is justified. A paper by Littlefair in 1998 gives annual cumulative internal illuminance measurements for a point in similar rooms with North and South facing glazing [Littlefair, 1998]. The rooms were un-shaded and un-occupied. An illuminance of 200 lux was achieved for approximately 58% and 68% of the year for the North and South facing spaces respectively. However, an illuminance of 400 lux was achieved for only 12% of the year for the North facing space with more than four times that occurrence (51%) for the South facing space. Of course, for sunnier climates the effect of orientation on daylight illumination will be greater still. The terms daylight and skylight are often used interchangeably, which often leads to confusion in evaluations and reports. Some of this muddle has resulted from the conflation of daylight per se with what is predicted by the daylight factor. For example, expressions such as: “the daylight factor was used to evaluate daylight levels”, are common in both research and practice literature. The daylight factor is a measure of relative illumination within a space compared to that of a standardised overcast sky condition. What the daylight factor communicates is very different from a prediction of the actual illumination levels that result from the full range of naturally occurring sun and sky conditions. Users of the daylight factor should understand that it is not a measure of daylight – rather the daylight factor is a proxy for actually occurring daylight illumination. How good (or bad) a proxy it is will depend on the building, its orientation and the local climate. In other words, it could only be assessed by comparison with more realistic measures of illumination, such as that provided by a climate-based daylight evaluation. This section will briefly survey the daylighting recommendations in some of the more commonly used guidelines. The intention here is to identify and discuss various problematic aspects of the recommendations. Indeed, some of them appear to be inconsistent and quite bamboozling. The schemes discussed include LEED, ASHRAE (draft 189.1) and The Pearls Design System (for Abu Dhabi). The glazing factor is similar to the daylight factor in that both are climate and orientation insensitive. To the onlooker uninitiated in the habits and beliefs of the traditional daylight practitioner, the notion that a climate-insensitive parameter could play a role in determining either the form of a building or the construction of its facade must seem very strange indeed. Particularly so when this parameter is applied uniformly across a continent that experiences such extremes in prevailing climatic conditions. Demonstrate, through computer simulation, that a minimum daylight illumination level of 25 footcandles has been achieved in a minimum of 75% of all regularly occupied areas. Modeling must demonstrate 25 horizontal footcandles under clear sky conditions, at noon, on the equinox, at 30 inches above the floor. Whilst this may appear, at first, reasonable, the LEED documentation gives no supplementary data for the evaluation. This omission all but renders the evaluation meaningless since there is no statement regarding the diffuse horizontal illuminance that the sky should be normalised against. The user, it seems, is to trust the default value that is provided by the sky generator program. The default value is an extremely coarse approximation with some latitude dependance, but no basis whatsoever in local, prevailing climatic conditions. Many users are unaware that the key input parameter for their simulation is of dubious provenance and has been automatically selected on their behalf. It gets worse. Nor indeed is there any mention of what the sun luminance (usually derived from direct normal illuminance) should be. Surprising, since the sun contribution will greatly add to the illuminances resulting from the diffuse sky (which will depend on the unspecified diffuse horizontal illuminance anyway). Given the relatively modest target illuminance (around 250 lux) it seems likely that the evaluation is meant to be carried out using a clear sky distribution without a sun. Which, of course, is a physical impossibility in reality. Anecdotal evidence has confirmed that users of LEED have indeed 'demonstrated compliance' with the recommendations and obtained Daylight Credit 8.1 by using a physically impossible luminous environment (i.e. clear sky without sun) that is normalised to an unknown value (i.e. diffuse horizontal). An indication of what might be missing from an evaluation that uses a clear sky without sun can be determined from the illustration below. This shows a simulated space under clear sky conditions with sun. The false-colour images show the components of illuminance: direct sun, direct sky, indirect sun and indirect sky - note the logarithmic scale. Omitting any consideration of direct and indirect sun will of course lead to a gross misrepresentation of the actually occurring room illumination under real clear sky conditions (i.e. with sun). Whatever the shortcomings of the daylight factor and glazing factor methods - they are many and manifest - at least those methodologies are self-consistent rather than arbitrary. With the Clear Sky option, major decisions about the building envelope could be made on the basis of meaningless data. The purpose of the above is not just to bring to attention an unsound methodology, which somehow appeared in a key guidance document. The LEED Clear Sky option is in essence an attempt at an incremental “advance” over the standard daylight factor method, albeit an evidently flawed one. The example however serves to illustrate an important point: the standard methods are in fact incapable of improvement by incremental means. Indeed, some of these “advances” are actually more confusing and less insightful than the standard methods they were intended to supplant, or, at the very least, complement. Consequently, it now becoming more widely appreciated that a full climate-based daylight study is needed to reliably evaluate the daylighting potential of a building. Furthermore, there do not appear to be any effective half-way measures e.g. predictions at the equinox, or the solstices. It should be noted that, at the time of writing this document [mid-2010], there appears to be no material anywhere on-line that is querying or challenging the formulation of the LEED Clear Sky option. This is evidently an unsatisfactory state of affairs, and one hopes that it will be remedied in Version 3. “The design for the building project shall demonstrate an illuminance of at least 30 fc (300 lux) on a plane 3 ft (1 m) above the floor, within 75% of the area of the daylight zones. The simulation shall be made at noon on the equinox using an accurate physical or computer daylighting model. Computer models shall be built using daylight simulation software based on the raytracing or radiosity methodology. As with LEED, there is no mention of normalising the sky to a specified diffuse horizontal illuminance, so the same shortcomings (outlined above) apply. As with the LEED Clear Sky option, the ASHRAE draft guidelines suggest (but do not clearly state) that the clear sky modelling is to be done without a sun – which is, as noted above, a physically impossible illumination condition in nature. By selecting the clear sky option, the designer is, in effect, specifying a higher daylight factor value as the target than would be the case with the overcast sky. The difference in the luminance patterns will also have an effect, but probably not as large as the difference in the (gensky default) diffuse horizontal illuminances. The default diffuse horizontal illuminance for a clear sky is around half what it is for an overcast. I guess gensky just apportions out the incident extraterrestrial solar radiation value between direct (sun) and diffuse (sky) for clear sky conditions, whereas it all goes into diffuse for overcast conditions (notwithstanding adjustments for turbidity etc.). Whatever the reason, there it is and we should not expect sky generator programs in default mode to produce values for quantitative comparison. Where light shelves have been proposed, an alternative calculation method that is based on Bright Sky calculation can be used. The submittal should include, as a minimum, quarterly calculations with 9:00, 13:00 and 17:00 data. Lighting levels should be calculated on the basis on 200 lux at the work surface. The daylight factor is to be calculated according to the methods described in the CIBSE Guide LG10. The Pearls Design System document however gives no further information regarding the “Bright Sky calculation”. A standardised climate file for Abu Dhabi is available from the EnergyPlus website: ARE_Abu.Dhabi.412170_IWEC. The cumulative annual illuminances determined from the climate files are shown below. 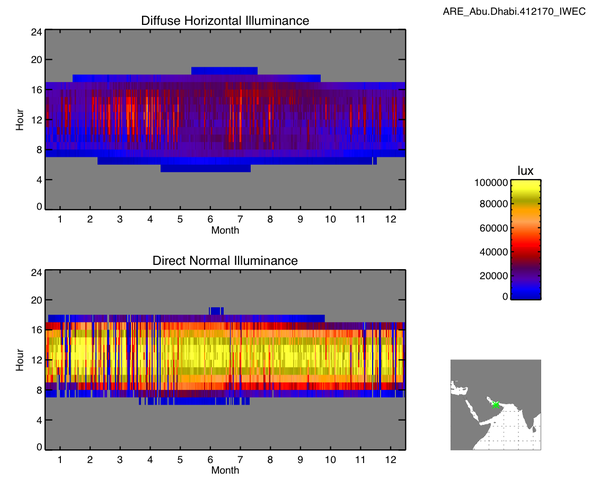 A visualisation of the hourly data for diffuse horizontal illuminance and direct normal illuminance illustrates just how dominant the direct sun component is compared to that for the diffuse sky. Evidently, the contribution of sunlight to illumination is markedly greater than that of diffuse sky. Furthermore, the diffuse sky luminance pattern will only rarely approximate overcast sky conditions. Accordingly, one must question the value and usefulness of design guide recommendations for Abu Dhabi that are founded on the daylight factor approach. The guidelines for the “Bright Sky” option are vague to say the least. That notwithstanding, the “Bright Sky” approach will be subject to the same highly problematic issues as the LEED and ASHRAE clear sky options. Update (08/11/10): It seems that the overcast sky option in Pearls has been dropped. It is not known if this commentary was a contributing factor. The 'Clear Sky' option, though also revised, nevertheless seems prone to the issues noted above. Say a designer is using one of the clear sky options (without sun as is apparently intended), but can't quite achieve sufficient illuminance (e.g. 30 fc) over the required floor area (e.g. 75%). A natural instinct would be to open up the facade to let in more light. The most effective way to do that would be to open up those facade areas that have the best “view” of the brightest bit of the sky: the circumsolar region – which is just where the sun will be in reality! The short version: I don't believe that the standard single condition method can be improved by incremental means (which is just what the various clear sky options are). In other words, it is not possible to “extend the [DF] method’s application to clear skies”. The only way to avoid the various pitfalls outlined above is to base an evaluation on a (full-blown) climate-based daylight simulation. [Hopkinson, 1963] R. G. Hopkinson. Architectural Physics - Lighting. Her Majesty’s Stationery Office, London, 1963. [Littlefair, 1998] P. J. Littlefair. Predicting lighting energy use under daylight linked lighting controls. Building Research & Information, 26(4):208–222, 1998. Actually, it is the radiance of a uniform sky that would produce the same diffuse horizontal irradiance as the specified sky radiance pattern, though this detail is largely irrelevant for the point being made. Note – daylight factor values are strictly only valid if the CIE standard overcast sky distribution is used. Allowing a choice of skies and simply giving a value for diffuse horizontal illuminance isn't really a fix because, soon as you angle your surface away from the horizontal, say vertically like a window, then the incident illuminance will be very different between the overcast and the clear sky options – and for the clear it will depend on the compass orientation. For a 10 klux sky (same diffuse horizontal illuminance for both clear and overcast), the vertical illuminance is 3919 lux for the overcast sky (all compass orientations) and for clear sky it's 5711 lux (south facing) and 3855 lux (north facing).